Deco canvases giving some ambiance to your home decoration ! Our collection of Daft Punk canvases shows the two famous DJs to mix and dance all night. 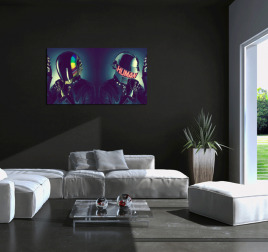 Always with a modern and design touch, those Daft Punk canvases will be perfect for a bedroom or in a disco-style restaurant for wild evenings. Our Daft Punk deco canvases show the two DJs in original photos or in pop art style to satisfy all their fans. A people artwork featuring the famous Daft Punk DJs in a highly modern style. This modern art print is 100 x 55 cm (39.37 x 21.65 po). Free delivery within 48/72 hours in metropolitan France for this decorative art print. Each modern art print is treated to withstand UV and moisture. 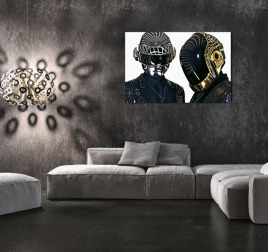 A people art print featuring the famous Daft Punk duo. This modern art print is 90 x 60 cm (35.43 x 23.62 po). Free delivery within 48/72 hours in metropolitan France for this decorative Daft Punk art print. Each modern art print is treated to withstand UV and moisture. Once again experience the atmosphere of Daft Punk music thanks to this people art print featuring these famous DJs! This modern art print is 90 x 60 cm (35.43 x 23.62 po). Free delivery within 48/72 hours in metropolitan France for this decorative art print. Each modern art print is treated to withstand UV and moisture. 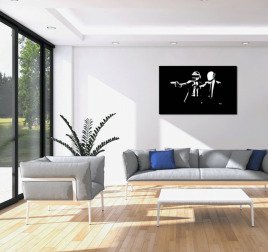 Stand behind the turntables with this people art print of the famous Daft Punk and Deadmau5 DJs! This modern art print is 90 x 60 cm (35.43 x 23.62 po). Free delivery within 48/72 hours in metropolitan France for this decorative art print. Each modern art print is treated to withstand UV and moisture.